Information: The Midland Railway (MR) and both their fore-runners and successor the London Midland and Scottish (LMS) were notorious for rebuilding locomotives. As such, the 4P Compound is a result of numerous rebuilds dating back to five such locomotives originally built by Samuel Johnson in 1902. Details: The class evolved from the almost identical MR Class 1000, of which 45 had been built and rebuilt between 1902 and 1914. During LMS days a further 195 locomotives were built of almost identical design to the rebuilds, being constructed at Derby, Horwich, North British Locomotive, and Vulcan Foundry Locomotive Works between 1924 and 1932. The layout featured a high pressure inside cylinder and two low pressure external cylinders, all featured super-heated boilers as specified by Richard Deeley. The only notable difference between earlier and later 4P builds were the reduction of driver wheel size from 7’-0” to 6’-9” diameter. Designed for passenger service through-out areas served by the combined LMS, 4P’s were often double-headed where loads dictated, primarily as the LMS had a shortage of larger and heavy duty or express locomotives required for such service. 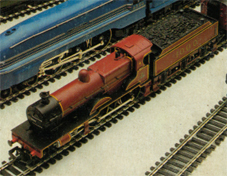 As the locomotive class was intended primarily for top-link passenger service by their builder, they were out-shopped in fully lined crimson livery. In accordance with BR policy the locomotives were deemed for lesser service and accordingly repainted in lined black livery. Although none of the 4P built locomotives survived into preservation, the doyen of the 1000 class has been and is currently on static display at the National Railway Museum at York.